Fake tan is something that creates mixed emotions for me. Let's just say I've had a couple of bad past experiences... the first was at a spray tan salon which resulted in me being left braless on Oxford Street (I had a top on but still...) and later, streaky in Ibiza. The second was a drunken affair involving a bottle of St Tropez and three bottles on wine... I passed out mid application with one half of my body done and woke the next day hungover and half-tanned cue mad scrubbing until my skin was red raw ...not to be repeated...EVER! So a few years on, I thought it was time to try again and give my skin a rest from all that sun worshipping...who am I kidding?! It's Winter and this is just to tide me over until the holiday season hits again!! A long weekend in Ibiza...very messy with a few regrets in the morning! Ok it wasn't all bad...that's a bit dramatic! Vita Liberata tan is the world's first 2-3 week tan, formulated specifically for sensitive skin to create a natural, long lasting glow. I trialled the dark long lasting mousse which was easy and quick to apply and tinted so you could see immediately what areas were left to tan. It claims to be scent free, which was true when applying however the biscuit aroma didn't stay at bay for long and was very evident the next morning and during the following day! I was pleased with the resulting colour - even and natural; a healthy minibreak-esque tan! However the most evident colouring had to be that of my white M&S Autograph bed linen...not ideal, but thankfully it all came out in the wash! Final words...it gave me a good natural colour which faded evenly however it definitely didn't last 2-3 weeks, that could have something to do with me only completing one application as the mess was definitely something that put me off further use! A week sailing along the Côte d'Azur...luxurious, rich and in parts a little choppy / tricky! 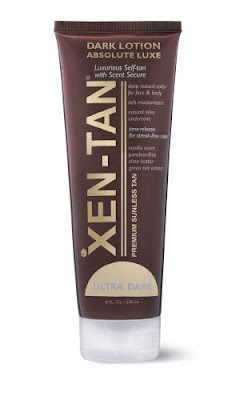 I tried the Dark Lotion Absolute Luxe a new addition to the Xen family, which promised to turn me a beautiful olive colour with no fake tan odour. It also contains Ginko Biloba, Green Tea extract, aloe and Shea butter so not only tans the skin but moisturises and adds all that extra goodness! When applying the lotion, there wasn't a tell tale tan smell in fact it smelt rich and chocolatey (this could be the Shea butter) this was still the case the next morning, so definite brownie points there! The next day a male colleague commented on my smelling of biscuits but I reckon he'd just had enough of sitting next to the fake tan trials! It did everything it said on the tube and gave me a really even, non patchy, deep olive colour. Not too dark but definitely noticeable after just one application, exactly what you want from a fake tan. The main draw back would be that the lotion wasn't that easy to apply. It was quite thick and hard work to rub in, the scariest bit with tan is the application and being confident that you will wake up without hideous streaks the next day. The result was really good, but this part of the process took longer than the others and made me feel a bit apprehensive about what I would wake up to! Final words...fab colour after one application, lasted well and faded evenly however not the easiest to apply. A party pitstop in Mykonos... Glam but laidback leaving you glowy rather than tanned (life's short, prioritise the parties)! Next in my exhaustive tan trials was Dave's Tan Gradual 10. This one isn't quite the same type of tan as the others, it's much more of a moisturiser with a hint of tan to build up a daily tint, but it's definitely worth a write-up. There are no overnight transformations or miracles, but what you do get is a super easy experience with subtle, non-scary results. The 10 in the name represents the following promises...moisturises, nourishes, protects, softens, soothes, smooths, evens out skin tone, delays effects of ageing, improves skin elasticity and firmness and finally develops gradually into a flawless tan! As I say, it isn't ground breaking in terms of the colour results...after three applications I looked healthy but I wouldn't necessarily say tanned. However it was perhaps the most hassle-free 'fake tan' I have ever applied, it was easy to rub in, instantly dried and there were no worries of coverage or areas going too orange. I felt like I was applying my daily moisturiser. I was happy with the colour having read what to expect. A draw back would be the strong tan smell, but as even the tans that promise to be odour-free rarely are, I'm sort of resigning myself to the biscuit-smell! Not hard work in comparison to others but a shame the results weren't more noticeable, having said this, my skin doesn't take as easily to tans as others (e.g. 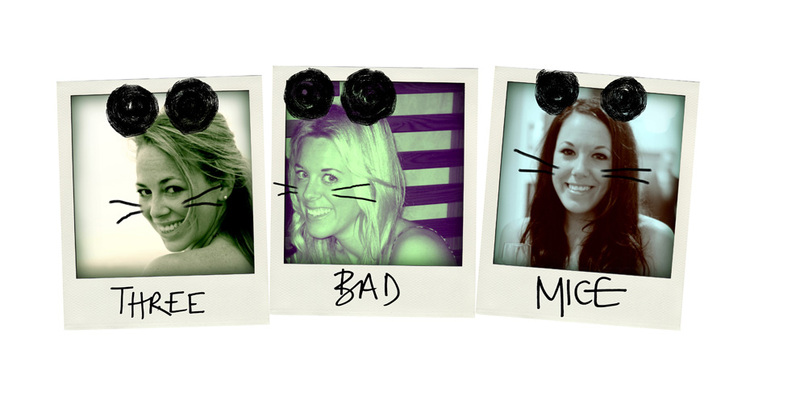 Middle Mouse) so this may have also been my own fault! £17.99 - at the moment £13.99! Final words...easy, pain free process with subtle results - definitely one I will use regularly but maybe not for an event or specific night out. Two weeks bronzing in Brazil... a sun-soaked fiesta as sultry and intense as the Latino barman shaking up your Caipirinhas! 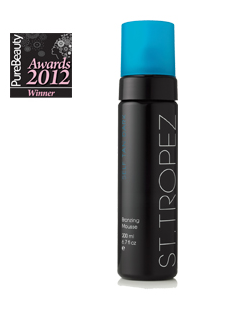 Last but not least, I tried out the St.Tropez Self Tan Dark Bronzing Mousse. St Tropez is obviously one of the most well known tan brands, I've been a fan in the past but never used anything from this particular range. The product comes with lots of scientific-sounding promises for example it boasts melanin technology that ensures your tan is tailored to your skin tone - amazing! I was really excited to try this one, as it has won numerous awards and the promise of an intense, streak free tan sounded like a dream come true! And my excitement was justified! It's safe to say I'm totally and utterly in love with this one...a deep, dark yet natural tan that suited my skin tone all after only one application! Forget 14 days of dutifully lugging your sunbed around every hour as the sun moves through the sky - instead opt for easy mousse application - no sweating, little physical effort required and no sun-baked wrinkles! The only draw back in my experience is the lack of clear application instructions (having re-read the instructions it does say apply tan to a mit but it wasn't stressed!!) which left me close to tears before bed certain that I'd wake-up with Oompa loompa hands and planning any outfit with extra long sleeves! That and the obligatory fake tan smell...not as strong as others, during application actually quite a nice smell but soon turning biscuity! However after all that panic, I was surprised to wake to only very slightly orange hands - over all a luxurious, even golden tan! Final words...very easy to apply mousse (the dark colour of it is pretty scary but useful to get even coverage, just make sure you wear gloves! ), amazing final colour and my favourite of them all...definitely to be used every week to keep me healthy looking in these long, drab wintery months!